You only have to say it and my toes begin to wiggle. Sharp , clean, grid formation. In my final year at University I spent an inordinate amount of time in the studios screen-printing my own graph paper. My favourite place to go – and one, which I visit often, is the London Graphic Centre. Tucked down a side street away from the bustle and the neon lights of the pineapple dance studio is a treasure trove for designers. All that lovely paper and equipment stacked and organized onto gleaming metal shelves. A haven for pen enthusiasts or as I like to call them; graphic designers. There is something fascinating about the infinity of patterns hidden within a piece of graph paper. It sits so nonchalantly next to the cartridge paper daring you to bring it to life. I’m sure I am not the only one to succumb to the lure of the grid, artists such as Sol Lewitt and Agnes Martin spent most of their careers obsessed with geometry. However I think there may be only one person who loves graph paper more than I and that is designer Wim Crouwel. Wim Crouwel was born in Holland in 1928, the son of a block maker within the printing industry. He studied Fine Art at the Minerva Academy but found his inspiration in architectural structures like electricity pylons and railway tracks. He designed his first poster in the 1950’s during which time he was painting and was greatly inspired by Expressionism. Crouwel soon realised the pleasure that organizing and visualizing information gave him and became fascinated by the Bauhaus movement. There couldn’t be a greater contrast between the poetry of Expressionism and the rational, functional essence of Bauhaus. He was intrigued particularly by Bauhaus typography and perhaps his background in the arts allowed him to think differently than other designers and develop his own unique ideas. He took a very balanced approach to Bauhaus and though he pioneered the use of mass production he also knew that machines could not work as precisely as the human eye nor treat the work with any feeling. 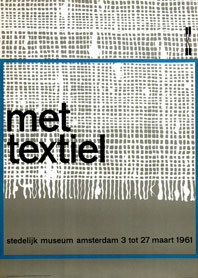 Crouwel’s work runs in two veins; the poetic and the functional. He is well known for his systematic and methodical approach using the grid system to experiment with typefaces. He was hugely influenced by Willem Sandberg and Hendrik Nicolaas Werkman who were both daring designers and typographers. He began making exhibition catalogues and posters for the Van Abbe Museum with the idea that each poster should be neutral and not try to interpret the artists style or work. The poster should provide information to the public without embellishment. But perhaps to some artists using the same typography and design for each exhibition would not be acceptable. On the other hand interpreting each artistic style into a new design could prove confusing and chaotic? Wim’s ethos was that typefaces should have no meaning themselves and should remain as neutral as possible – the meaning being found in the content. He liked sans serif fonts such as Helvetica, Gill and Universe for their simplicity and minimalism. This could be due to his split interests in Expressionism and Bauhaus. To have mixed or possibly conflicting passions is certainly a useful thing as it forces you, as an artist/designer, to merge and intermingle your ideas, forming new and wonderful creations! Well….I’m off to the London Graphic Centre to buy some paper and pens then set to work on my own typefont!